Edited by: Gudrun Miehe, Clarissa Vierke. This series edits unpublished works on the language and literature of Africa and on the history of ideas. Often precious documents are hidden in private or institutional libraries because they could not, for various reasons, be published by their authors. It is the aim of this series to secure these documents by means of publication, to revise and – if necessary – to annotate them, and to make them available to the public. Compiled by: Terttu Heikkinen †. 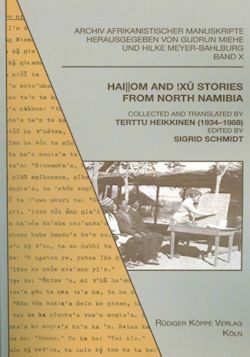 Translated by: Terttu Heikkinen †. Edited by: Sigrid Schmidt. With an introduction by: Antero Heikkinen. Author: Gudrun Miehe, Clarissa Vierke. In collaboration with: Sauda A. Barwani, Ahmed Nabahany. Author: Roland C. Stevenson †. Edited by: Thilo C. Schadeberg. Edited by: Gudrun Miehe, Abdilatif Abdalla, Mohamed H. Abdulaziz, Zeina Al-Bakary, Angelica Baschiera [show more…], Ahmad Bhalo, Clarissa Dittemer, Ahmed Nabahany, Yahya Omar, Farouk Topan. Edited by: Gudrun Miehe, Katrin Bromber, Said M.A. Khamis, Ralf Großerhode. Author: Otto Dempwolff †. Edited by: Ludwig Gerhardt, Justus Roux. Compiled by: Paul Berger †. Translated by: Roland Kießling. Edited by: Roland Kießling. Compiled by: Edwin Ardener †. Edited by: Bruce Connell. Compiled by: Johannes Stöckle †. Translated by: Johannes Stöckle †. Edited by: Johannes Stöckle †. Compiled by: Georg Tischhauser. Translated by: Johannes Stöckle †.